‘Access to pesticides - An explanation for minor industries’ is a new booklet published by the RIRDC.  Sources of the latest pesticide registrations and permits.  Information on the APVMA Minor-use Permit System as an avenue for farmers/industries to access unregistered pesticides.  Information on the procedures and data required when applying for a minor-use permit.  Information on the AgVet Chemicals Collaborative Forum and the option to co-fund data generation projects for specific crops. This document was sponsored by RIRDC and the Australian Government and developed through PRJ-010111 - Minor Chemical Consultant for small and non-levied industries. You can download it at https://rirdc.infoservices.com.au/items/16-006 or click on the pdf below. Broadleaf and grass weeds need to be controlled routinely as they will use fertiliser and water at the expense of your crop and may shade young plants. They can also harbour pests and diseases. Use herbicides, weed matting, mulching, hand weeding or a combination of these. Only a limited range of herbicides have been tested on native Australian and South African plants. Some species are very sensitive to them; for example, kangaroo paws, waratahs and grevilleas will not tolerate glyphosate drift. Neal JC, Gordon I. 2004. Weed management in woody cut flower plantations.Centre for Native Floriculture: www.uq.edu.au. Correctly identify and understand the pest or disease problem in your crop before you take action. You can also use sticky traps to monitor flying insects like thrips and psyllids effectively (available from most farm suppliers). Because wildflower production is a relatively small industry, there may be no registered pesticides available for certain pests or diseases. Regulations on the use of pesticides are strict. A product has to be registered for a species and the situation in question before you may legally use it. There is also a Minor Use Permit system to cover off-label uses of pesticides (see www.apvma.gov.au for details). Whenever you use a new product for the first time, read the label carefully. Check for advice on phytotoxicity and trial the product on a small area of crop first. You are responsible for choosing the correct chemical and rate of application. Use the correct protective equipment and get training in safe use and handling of pesticides. With flowers destined for the export market, attention to pest and disease management is essential. Many countries, particularly Japan and the USA, have zero tolerance for pests and diseases. Postharvest disinfestation of product before shipping is necessary. This will be easier if you have competently managed pests and diseases during the growing season. Nursery and Garden Industry of Qld. 2009. Insects, beneficials, diseases, disorders and weeds of nursery production. Download onto a PDA via an external Secure Digital (SD) memory card or buy on CD-ROM. Contact NGIQ on 07 3277 7900 or see details in the information box below, including an order form. How do you find out which pesticides are registered? APVMA is the Australian Government authority responsible for the assessment and registration of pesticides and veterinary medicines and for their regulation up to and including the point of retail sale. Its role is to independently evaluate the safety and performance of chemical products intended for sale, making sure that the health and safety of people, animals and the environment are protected. Only products that meet these high standards are allowed to be supplied. APVMA does not register products if their use is likely to jeopardise trade or if they don’t work. Search the APVMA website to find registered pesticides (if a product is not listed, it’s probably not registered) – select PUBCRIS (Public Chemical Information Registration System) on the menu and search by the product name or the active ingredient name. There is also a Minor Use Permit system to cover off-label uses of pesticides. Please refer to the attached Excel file which offers a spreadsheet of all the current minor use permits that have been issued for the crop group ‘Ornamentals and nurseries’. This has been prepared by AgAware Consulting Pty Ltd for the Horticulture Australia funded project NT10029 ‘Managing pesticide access in horticulture’. Updates will be added to this website as they are received. 1. Do these pesticides still function effectively as per the use pattern on the permit? 2. Have there been any adverse experiences with any of the permits (see attached list) used by your industry? An adverse experience is an unintended or unexpected effect on plants, plant products, animals, human beings or the environment, including injury, sensitivity reactions or lack of efficacy associated with the use of an agricultural chemical product(s) when used according to label (or permit) directions. If you answered yes to either of these questions, could you please complete the attached Adverse Experience Report Form. If no response is forthcoming then it is assumed that the pesticide is functioning in accordance with the permit and that there are no adverse experiences to report. Growcom’s InfoPest is a comprehensive database of agricultural and veterinary chemicals/medicines registered in Australia by the Australian Pesticides and Veterinary Medicines Authority (APVMA) or approved via the APVMA permit system. It has been recognised for many years as a comprehensive and easy to use source of information. The database is very easy to search, a one-stop shop for accurate, up-to-date information for the effective control of weeds, pests and diseases in a wide range of crops (and also livestock). Using Infopest will help you to reduce costs and generate increased returns (by choosing the correct product to manage your target pest or disease), while at the same time taking care of your legal obligation to protect yourself, your workers, consumers and the environment. Infopest is regularly updated with new and/or updated products and/or permits that have been registered or approved by the APVMA. Infopest is available free online. To register for Infopest free online, visit www.infopest.com.au. For more information please call Growcom on 1300 367 911. PestGenie is an on-line system designed to support effective and appropriate use of crop protection products (and also animal health products). Annual subscription to PestGenie provides convenient access to a wide range of information on a broad range of products including downloads of Material Safety Data Sheets. Pest Genie is available on a user pays subscription basis only. Nursery & Garden Industry Queensland have produced an electronic identification resource called ‘Insects, Beneficials, Diseases, Disorders and Weeds of Nursery Production’. It’s an updated version of the booklet with the same name originally developed by a Horticulture Australia project and published by NSW DPI. 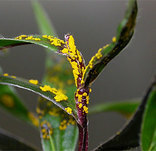 With the increasing use and availability of small hand held computers (personal digital assistants or PDAs), this on-farm identification tool, covering pest and beneficial insects, plant diseases, nutritional disorders, and weed identification, has been developed for ornamental plant growers and will be very useful if you grow wildflowers. The resource has all the data stored on a memory card that is inserted into the PDA. A CD-ROM version is also available. The identification tool has almost 200 factsheets with 778 images and uses touch screen, menu navigation. More information and an order form is available in the attached pdf file. The LBAM has already caused serious concern in USA and the US government is working to eradicate this insect from causing further damage to their horticultural industry. Australian growers who export flowers, foliage and other produce to the US need to be extra vigilant and aware of the risk this native Australian insect can pose to their business and to the wider industry. This page will help you learn more about this insect and help you to ensure that your shipments are insect free. The factsheet is attached with acknowledgement to the SA Department of Primary Industries and Resources. There is also information on LBAM in Australian Flower Industry magazine Issue 21, page 9. The information is provided to all visitors by WildFlowers Australia Ltd to reduce the risk of a quarantine breach and its impact on the floriculture industry. Are you in a position to share what you know about insect and how it can be managed? Email WFA Ltd (management@wildflowersaustralia.com.au) and we will consider including your knowledge and control tips on this web page.